Born in Glasgow, she studied art history at Edinburgh University and drawing and painting at Edinburgh College of Art. As a student, she attended Joseph Beuys’ famous lectures in Edinburgh and organized the controversial Participation Art Event at Edinburgh College of Art, featuring the Artists Placement Group and David Medalla. 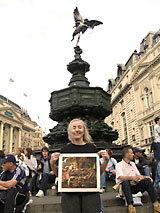 Moving to London, she became a founder member of the Poster Film Collective and of Artists for Democracy. After completing a post graduate degree in architectural studies at University College, London, she became a writer, contributing to many art magazines including editing Performance Magazine. As a business journalist she worked for Financial Times Business Publishing before becoming a regular contributor on contemporary art for the Financial Times newspaper. She returned to art making in the late 1990s.